“When you share utensils, it’s like giving germs from one baby a FastPass directly into the other baby’s mouth,” says Rallie McAllister, MD, MPH, a mom of three sons, a family physician, and coauthor of The Mommy MD Guide to Your Baby’s First Year, in Lexington, KY.
extremely hardy. They can live on objects for several hours. Babies can pick up those germs when they touch someone’s hand or pick up food, a toy, or eat from a utensil. Another danger of sharing utensils is people with tooth decay can transfer those germs to babies. Yes, you read that right: You can literally catch cavities from other people. According to the American Academy of Pediatric Dentistry, parents need to avoid all saliva-sharing behaviors, including sharing spoons and other utensils, sharing cups, and cleaning dropped pacifiers or toys with their mouths. Using two spoons, not one, is key to keeping the colds and cavities away. A clever product to try is the Twin Feeding Set. Created by mom of twins Heather Karpinsky, it’s two spoons joined at the handle, allowing moms to feed one baby with each. 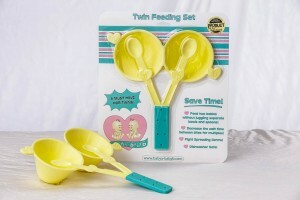 [link to http://www.babya-babyb.com/] The Twin Feeding Set costs $16.99 (includes shipping), and they offer a money back guarantee. Save 20 percent with the coupon code MOMMYMD. Visit www.babya-babyb.com for more information.